The most basic part in employment management is making sure that the information you have about your team is relevant and up to date. With Workbase you can rest assured that these details are accurate. Understanding the talent and attributes you have in your organisation means you can make better business decisions about recruitment, training and performance management. Never miss or forget about an employee request for time off or an important event such as a performance review again. Workbase helps you quickly see and respond to requests at a glance. Attract the best people. Workbase has a complete Recruitment and Applicant Tracking System built-in. Stay on top of all your recruiting tasks, and when you are done you can convert the applicant into an employee. 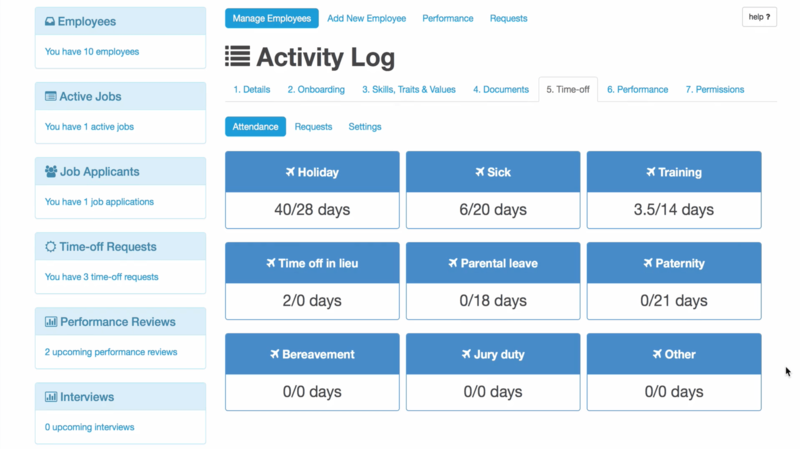 Manage employee information, HR documents, performance, as well as holiday & sickness, directly within Workbase. What's more every employee gets a free self-managed Workbase account. Seamless Onboarding, Noticeboard & Notifications and Roles & Permissions keep your employees feeling engaged with you. Employees can now engage directly through their self-managed Workbase account. Workbase can help you understand which areas of your HR need improved. With free tools like The HR Health Check and our useful stats from your Workbase account, you can take the right steps to improving your team. Know exactly where each employee stands with their time off allowances. Workbase will automatically calculate the number of remaining days once requests are approved. See at a glance who is going to be away and why. Make decisions on incoming requests, and see which requests need to be approved with our colour-coded calendar. Know exactly how many days every employee has taken off and why. Identify attendance issues and take action to resolve them with Attendance Scorecards. Get a professional, customisable Careers Portal with Workbase. Wow, future employees, with the simplicity and smoothness of your recruitment process. 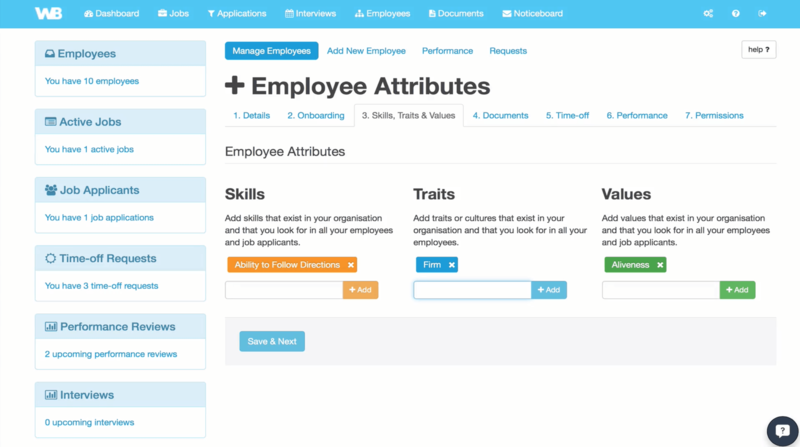 Build application forms for all your roles. Embed your application forms into your job postings. View responses quickly. Post jobs to your career portal. Our 6 step posting process ensures you include all the important information. Never be overwhelmed by jobs applications ever again. Our effective applicant tracking system ensures you stay on top of your recruitment. Take the time and pain out of interview scheduling. Workbase automates the scheduling of interviews with your applicants so you don't have to. Show respect to applicants by responding to everyone. Our applicant tracking system enables you to quickly respond to applicants en masse. Keep all your documents safe, all in one place. Upload your important HR documents to you organisation's document store. Every staff has a personal document store too. Time-off and absence management is a breeze. Quickly view and respond to time-off requests. Easily identify issues before they arise. Improve your entire team's performance. With auto-scheduling calendar views, and easy note taking, you can keep track of employee performance. Keep your organisation's structure in-check. Workbase ensures your organisation stays organised even when you are growing. You only get one chance to make a good first impression. With our on-boarding feature, you can make the best first impression to your new employees. Every employee gets their own self-managed Workbase Account so they can stay engaged and submit requests quickly and easily. Keep your inbox clear by posting messages to your Workbase Noticeboard. Employees can reply and everyone can keep up to speed with the conversation. Does Michelle in marketing need to be able to recruit for her team? Workbase Permissions lets you control the level of management access you give your employees. Our useful email notifications mean that everyone can be kept in the loop, even when they are not logged into their Workbase account.